As gardeners, we probably understand the importance of eating locally produced food much better than anyone else. Why eat locally grown food? Because food that doesn’t need to travel can be picked at the right ripeness time, making it taste so much better! And because it’s fresh off the vine. Remember picking a warm tomato form the garden and eating it right there? Ohhh…. delicious! 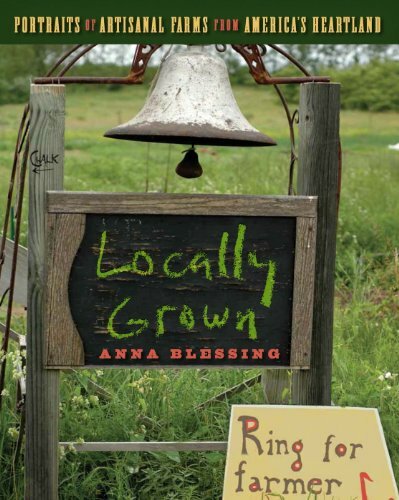 Locally Grown: Portraits of Artisanal Farms from America’s Heartland We’ve been spoiled: at any time in the year we can go to the grocery store and buy whatever we want: berries, tomatoes, greens, etc. You name it, and the store probably has it or can get it for you. Food has become big business and it isn’t unusual to find a vegetable, fruit, or piece of meat that was produced and processed on a different continent. Our beef comes from Argentina and most of our fresh fruits and vegetables are grown in California. We spend an insane amount of resources shipping food from one end of the country (or the world) to the other end. It wasn’t always this way though and it may be time to reconsider global food. Let’s talk about the importance of eating local, seasonal food. 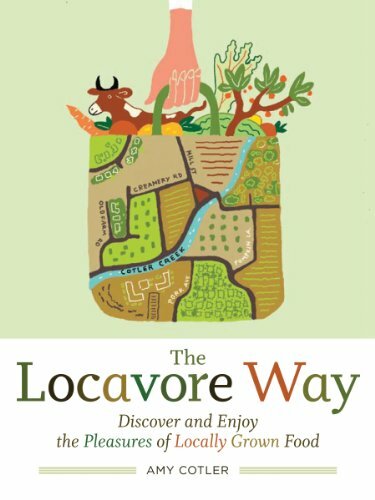 The Locavore Way: Discover and Enjoy the Pleasures of Locally Grown Food While grocery stores similar to what we see today have been around since the 1920s, they didn’t become widely available until the 50s. The question then is: how did people shop for food before then? How did you get your groceries before you were able to drive down to the local grocery store to pick up anything your family wanted to eat? Food was grown and sold more locally. You’d head to the butcher who was working with farmers and ranchers in the area to get fresh cuts of meat. You’d head to the bakery for bread, and a fruit and vegetable shop for fresh, locally grown product. You likely also had your own kitchen garden where you grow a lot of your own veggies. If you were lucky you may even have had a few chickens run around in the yard for a steady supply of eggs. And that is exactly what local food is. It is food produced fairly locally. It may be grown or produced a couple of hours away from you, but it is roughly from your area. We’re starting to see a resurgence in locally grown food with the popularity of farmers markets, farm to table programs, CSA memberships and of course, the slow food movement. 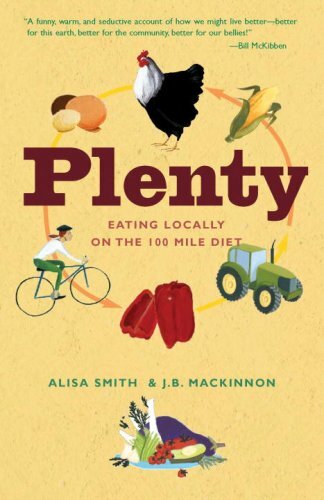 Plenty: Eating Locally on the 100-Mile Diet This means that you eat food that’s native to your area, or at least something that can be grown in your climate zone. It also means eating more seasonally and enjoying fresh produce as it comes into season. And that’s not a bad thing. You’ll notice that locally grown tomatoes in season taste infinitely better than hothouse grown tomatoes or strawberries that were picked green and barely taste like they should when they reach your table. It also means cooking more from scratch instead of picking up convenience food, or processed food where you have no idea where the ingredients came from and what has been done to them. In the end, once you start to embrace local food you’ll eat healthier by buying fresher, more seasonal food. Let’s explore this a little further. One of the big advantages of eating local food that’s in season is that it’s healthier for you. This food hasn’t been picked before its prime. Instead it is picked close to the peak of ripeness and getting to your table or your plate much faster. This keeps more of the nutrients alive, ending in food that not only tastes better, but is also better for you. And simply by the nature of eating local, seasonal food it cuts out a lot of processed “food-like” products. You end up eating more natural, real produce. That alone can have a huge impact on your overall health and even your weight. So many of the serious health issues we’re dealing with today from heart disease and stroke, to high blood pressure and diabetes, can be traced directly to the introduction of processed food. By changing your diet to include more real food, you can greatly reduce your risk for any of these “lifestyle” illnesses. The advantages of eating local, seasonal food don’t end there. Frankly, producing food and eating this way is a lot more sustainable in the long run. When you think about it, it doesn’t make a lot of sense to grow food in one part of the world and ship it to consumers in another area. That takes a lot of extra resources and fuel, just to truck and ship all that grain and rice for example from one continent to the next. It can also get our food supply into big trouble as we’re seeing now with fresh fruits and vegetables. I mentioned earlier that much of it is grown in California. With the severe droughts and water shortages in that part of the US, a portion of our food production is at the verge of being obliterated. Without the farms and infrastructures in place in other areas of the country, this could cause some serious long-term shortages. Then there are all the environmental issues industrial food production and large scale food transportation cause. All this adds to the pollution and global warming we are facing. Giving up almonds grown in California or tomatoes from Holland may seem like a small thing to do, but if we embrace producing and consuming local food and change from buying processed food to real food, we can do our part. Each person making even the smallest changes will add up. And that will have a big impact on the environment. Think about what you can do to embrace more local, real food. We’ve talked about what local food is and why it is important to spend a significant portion of your food budget on this type of food to make a difference on your health and the environment. The next question is of course where you go to find this type of food. Your local farmers market is the perfect place to get started. Not only can you shop for a lot of your food staples including fruits, veggies, eggs, bread, and, if you’re lucky, even milk, cheese and meat there. It’s also a great place to get a foot in the door with the local farming community. Shop your farmers market regularly and talk to the farmers you meet there. You never know what you may learn and what connections you will make. If you’re looking for a particular type of food, the farmers you talk to, may be growing or producing it, and just not bringing it to the market if there wasn’t much of an interest previously. If not, they may know someone who sells raw milk or grass fed beef, for example. They can get you in touch with other local food producers in your area. CSA (Community Supported Agriculture) is another great way to dip your toes into local, seasonal food. Go to http://www.localharvest.org/csa/ to find farmers in your area that participate in the program. The way it works is that you pay a fee set by the farmer at the beginning of the season. Basically, what you’re doing is buying a share in the harvest for that particular farm. You pay a set amount of money for your share and throughout the growing season, you get boxes with your share of what’s been grown. The interesting (and fun) part is that you never know exactly what you’ll get. You end up with what’s been growing well and what’s ripe and ready at the time. I love CSA harvest shares because they make me think outside the box 😉. Since I’m never quite sure what I end up with in the box, I get to experiment with and combine all sorts of different fruits and vegetables. Not only does it make for a fun cooking experience it’s also a great lesson in cooking seasonably. 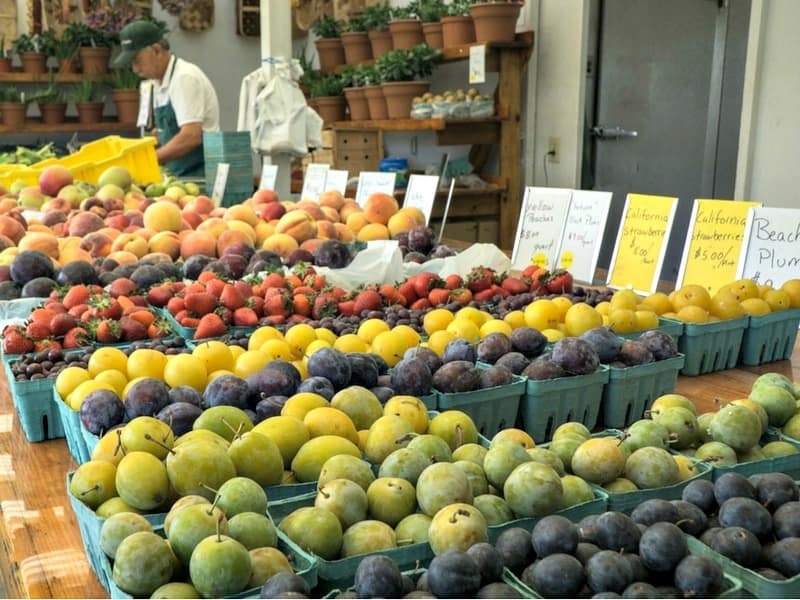 As you get to know your local farmers through the farmers market and the CSA program, you’ll get a chance to find more and more locally produced food. These farmers may also share what shops they are selling to, which can then become part of your weekly or monthly shopping trips. Another great way to find more places to shop local is to talk to like-minded local food enthusiasts as you’re out and about. Start conversations with other people shopping at the farmers market, the farm, the local produce shop etc. Together you can each learn more and find more places to shop and support. Eating healthy often comes with a price tag. I don’t have to tell you that it costs a lot more to buy fresh cucumbers and radishes than it does to pick up a bag of potato chips at the grocery store. While you won’t be able to beat cheap grocery store prices for food, particularly cheap convenience foods, there is a lot you can do to cut down on the amount of money you spent on healthy, local food. Before we get into the nitty gritty of saving money, let’s look at the bigger picture. Eating food that’s good for you, instead of processed crap full of sugar and salt, will pay off big in the long run. Health care costs aside, there are some simple little things you can do to eat local, seasonal food on a budget. Start by buying directly from the producer as much as possible. If you can buy directly from the farmers, you cut out the middle man and any cost associated with that. Start with local produce stores if you need to, but try to get in touch with local farmers as quickly as possible. The CSA boxes we talked about earlier are another great way to get a lot of fresh produce for a relatively small amount of money. Buying in bulk is another great option. You can get a much better deal if you buy by the bushel or crate. You can then “put up” much of the food and use it throughout the rest of the year. If you don’t want to preserve a whole bunch of food, consider finding a few friends or family members interested in eating healthier. Go in and buy produce in bulk together and then divide it up between all of you. This also works really well if you’re looking at bulk produce that’s a little further away. It’s a lot more economical to have one family ride up to the mountains to a local apple orchard to buy bushels of fresh mountain apples and then divide it up, than it is for all of you to go up and buy smaller, more expensive quantities. Not only will you save by buying in bulk, you save even more in fuel cost and of course time. Last but not least, think about what you can grow in your own back yard, on your patio, or even on your kitchen counter. It’s surprising how much you can grow yourself even with little-to-no space. Start with a few fresh herbs grown in pots on a sunny window sill. Then add a lettuce growing bowl to your counter, and a few tomato plants on the back patio. Expand from there and look into gardening boxes and other easy care, space saving gardening methods. Vertical gardens are a great option if you don’t have a lot of room. Start expanding and grow more and more of your own food. It doesn’t get any cheaper, or more local than that. Trade with other gardening neighbors who grow different fruits and vegetables for more variety. Whether you buy in bulk, come across a deal at the farmers market that’s just too good to pass up, or get a bumper crop in your own backyard, there are times when you end up with more fresh fruits and veggies than you can use and eat right away. 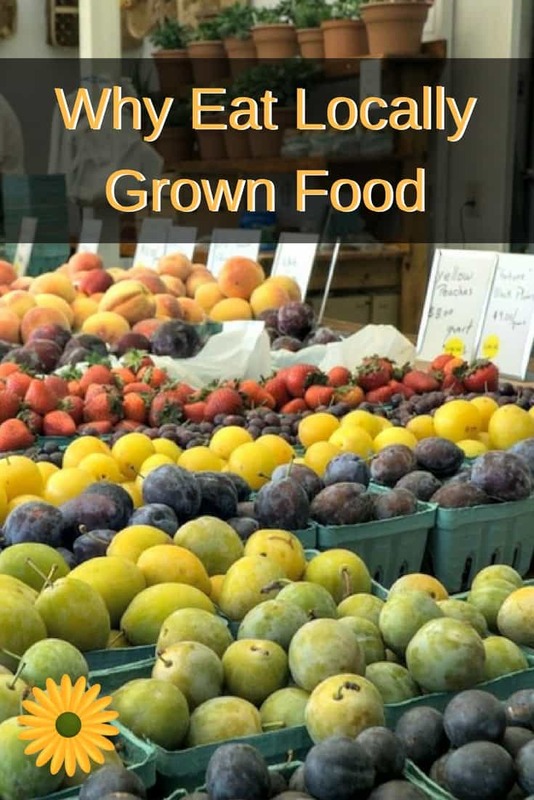 It’s a good problem to have and it will help you through the times of year when your farmers market is closed and your garden doesn’t produce much. I’m talking about preserving your fresh local food of course. There are all sorts of different things you can do to preserve food to use down the road. One of the easiest things to start with is freezing food. Many foods like berries for example, can be frozen straight from harvest. Many fruits can be washed, sliced and frozen. Peppers, tomatoes, squash and the likes work the same way. Here are 4 ways to freeze zucchini. We also slice and freeze quite a bit of okra and even onions and garlic to use down the road. Fresh herbs can also be frozen and used in dishes throughout the year. Another option is to fix your favorite soups, stews, and vegetable dishes that freeze well. Cook one serving to use for dinner and freeze the rest. Eventually though you’ll run out of room in your freezer. Other great options are pickling, canning, and dehydrating. Do a little research and learn more about each method. You can dehydrate apple slices and such on the lowest setting in your oven. If you find you like the process and the resulting food, consider investing in a dehydrator. Before you get into canning, make a batch of two of freezer jam and refrigerator pickles. You preserve some food and get a feel for part of the process without getting into the slightly more difficult part of canning food safely. From there read up on safe canning methods, talk to people in your family who have canning experience, borrow some equipment and give it a try. Start with canned foods you know your family will use throughout the year. Tomato sauce and various soups are always popular options for us. I hope this has inspired you to explore all the amazing local food that’s just waiting to be found in your area. Buy it, fix it, eat it, and even learn to preserve it. You’ll be amazed at how much better real, local grown food tastes.